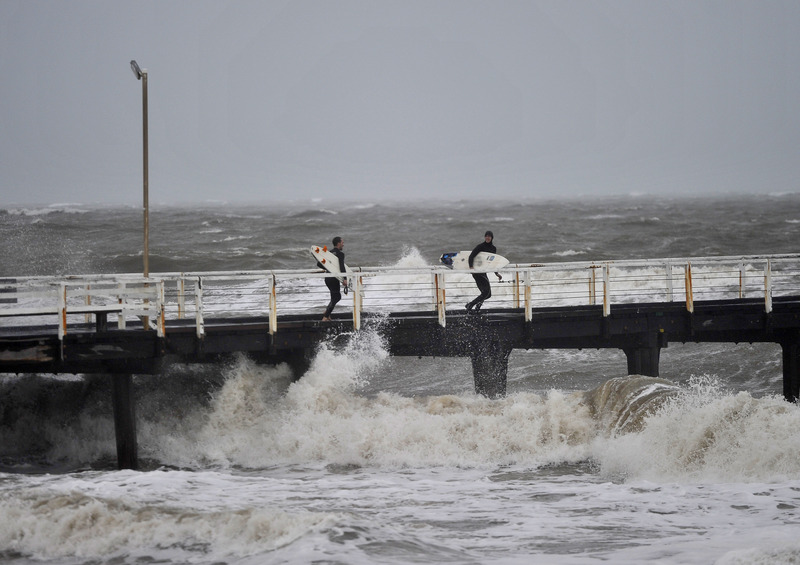 UPDATED: The storms are gone but flood risks remain for many South Australians battered by this week’s severe weather. The Bureau of Meteorology has issued a major flood warning for the Gawler River Catchment, and a moderate warning for the Torrens River. There are also concerns – albeit lesser – for the Onkaparinga, the Angas and Bremer rivers and the Light and Wakefield rivers. The State Emergency Service warns the the Gawler flooding could threaten residents’ safety. “Suburbs which may be impacted include Hillier, Gawler River, Angle Vale, Penfield Gardens, Two Wells, Lewiston, Virginia, Port Gawler and Buckland Park,” it said in a statement. Rivers in some areas are still rising, with some properties already inundated and several roads cut. Concerns to the north are centred on properties along the Gawler River and others around Tanunda where the caravan park has been evacuated. The SES has issued a warning for people not to enter floodwaters by car or on foot after crews performed six swift-water rescues involving motorists stranded in their vehicles. But the flood concerns for other centres, including Port Pirie and Clare have reduced after a wild night of destructive winds and heavy rain. Improving weather across the state has allowed SA Power Networks to reconnect more properties after Wednesday’s statewide blackout and ongoing issues with storm damage. SA Power Networks said this morning about 10,000 properties were still without power due to transmission loss, mostly on the Eyre Peninsula and in the far north. A further 18,000 properties have lost distribution in the past 24 hours due to the wild weather. Transmission company ElectraNet says ground crews are continuing to work on the line between Cleve and Port Lincoln to repair a fault that only became evident during an earlier attempt to restore services. It also hoped to survey lines to Roxby Downs and Leigh Creek from the air on Friday. Concerns are growing for some regional centres where power has been out since Wednesday, cutting the supply of fresh food and access to fuel and cash. The several thousand still without power because of other storm damage were largely dotted through the Adelaide Hills. SA Power Networks spokesman Paul Roberts said safe access to lines and other equipment had proved a real issue during the severe conditions with extra contractors brought in to relieve tired crews. The Bureau of Meterology has cancelled all severe weather warnings for SA but has forecast more light rain across the flood-affected areas on Friday. Premier Jay Weatherill has flown into Port Lincoln today, which is still without power two days after the all-state blackout. ElectraNet said today its crews were “working hard” to restore power to Port Lincoln and had begun inspecting transmission lines to the far north of the state. “Crews with cranes and other equipment have been dispatched to a fault detected west of Tumby Bay, which is affecting the restoration of power to Port Lincoln,” ElectraNet said. Other ministers are visiting hard-hit regional areas today with Emergency Services Minister Peter Malinauskas heading to Gawler and Greenock, Transport Minister Mullighan going to the mid-north, and Treasurer Tom Koutsantonis travelling to Whyalla where the Arrium smelter faces a potentially dire situation due to the blackout. The Premier’s trip comes as the state emerges from two days of wild weather, which have had numerous impacts on businesses and some personal costs. It emerged today that 12 families had lost embryos at an Adelaide fertility clinic hit by power outages. Flinders Fertility, which is housed in the Flinders Medical Centre, was left without power when the FMC’s backup generators failed during the statewide blackout on Wednesday, compromising incubators. The clinic said in a statement despite every effort by scientists, the embryos are no longer viable. Businesses, particularly in rural areas, are being hit hard. The Australian Industry Group fears the statewide power outage in SA will lead to big costs, with smelting company Nyrstar already expecting a $5 million loss. Nyrstar chief executive Bill Scotting says the Port Pirie site will be out of action for up to a fortnight but it’s working hard to restore the blast furnace to full functionality. Nyrstar has joined the growing list of major companies to suffer losses with Steelmaker Arrium halting production at Whyalla as well as BHP Billiton and Oz Minerals at their Olympic Dam and Prominent Hill mines. The latest storm blast overnight brought down trees across a wide area and ripped some buildings apart. Some of the worst-hit areas were the Clare Valley, north of Adelaide, where the town of Sevenhill was under threat with concerns a nearby dam would burst, and Langhorne Creek, south of Adelaide, which was cut off by rising floodwaters late on Thursday. Coastal areas copped a battering. The intense low pressure system that smashed SA was packing winds of up to 140km/h, among the strongest the city has experienced, prompting an unprecedented warning from police for workers to head home early and stay home amid concerns emergency services might not be able to cope. The State Emergency Service had responded to 1500 calls for help in the past 48 hours. Wednesday’s blackout was caused when ferocious winds ripped up more than 20 transmission towers in the mid-north, taking out three of the state’s four major transmission lines. Weatherill described the storm as “catastrophic” and said it had involved weather events not seen before in SA, “such as twin tornadoes, which ripped through the northern parts of our state”. Transmission company ElectraNet said most services had been restored and it hoped to have one of the transmission lines repaired by Sunday, using temporary towers from interstate. The company also backed assertions from the premier that no energy system in the world could have survived such an event without going down.